Pulled Portobello is a great vegetarian and vegan alternative to pulled pork. These Pulled Portobello Tacos are easy to make and absolutely delicious! Clean the portobellos and heat in a large pan on medium heat without oil. Season with salt. Caramelize the onions in the same pan by adding water when they stick to the pan. After 10 to 15 minutes, the onions and portobellos should be soft. Transfer the portobellos in a bowl (we don't want to scratch the pan) and pull/mash them apart with two forks to get that authentic 'pulled'-look. Transfer the pulled portobello back in the pan to the caramelized onions, add bbq sauce and mix everything together. Re-heat until hot. 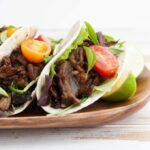 To assemble the Portobello Tacos: Fill chopped lettuce, then the pulled portobellos and the halved cherry tomatoes into the hard-shell tacos. Sprinkle with thai basil and enjoy!